A type of vegetable with a white taproot and leaves at the top. Turnips are vegetables that first appeared in Yume Kōjō: Doki Doki Panic. They are frequently found in Subcon. Turnips make their first Mario game appearance in Super Mario Bros. 2. They are planted in the ground everywhere in Subcon, especially in grassy regions of the world. Turnips can be picked up and thrown at enemies to defeat them. The Dream Machine can also produce turnips which can be used as weapons for the player to damage Wart. 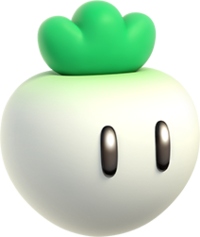 Turnips make an appearance in the direct sequel, BS Super Mario USA, and are used for the same purpose as in the previous game. Sometimes, enemies can be turned into these vegetables by certain characters' spells. Using e-Cards, ripe and unripe turnips can be brought into the main game in Super Mario Advance 4: Super Mario Bros. 3 via the Blue Green Switch, whose e-Card simply refers to them as "vegetables." They are also found in various World-e levels, namely Vegetable Volley. The game also features pickable giant turnips, from Super Mario Advance. They can be used in the same manner, though Frog Mario cannot grab turnips. After a 14-year absence from the Super Mario series, turnips reappear in Super Mario Odyssey, where they are objects that can be plucked from the ground and thrown to attack enemies. Three golden ones also exist, and they give Power Moons when thrown into the soup at Peronza Plaza. Peach and Daisy's down special move, originating from Super Smash Bros. Melee, is picking up turnips (referred to as simply "vegetables" in Super Smash Bros. Melee's trophy description) and using them as projectiles. The facial expression of the turnip determines the damage and knockback it causes (e.g. winking turnips cause more damage and knockback than normal smiling ones). The strongest variety of turnip, the sick turnip, is rare, but extremely powerful. In the boss battle with Wiggler in Mario & Luigi: Bowser's Inside Story, the Wiggler may water the ground and some sprouts will grow. Two of the three possible objects he pulls out are ripe and unripe turnips. In Mario & Luigi: Superstar Saga + Bowser's Minions, Shy Guys attack enemies by throwing turnips in the Minion Quest: The Search for Bowser mode. During their Special Skill, Throw the Fight, they throw a larger turnip at a targeted enemy. A turnip makes a minor cameo in WarioWare: D.I.Y. 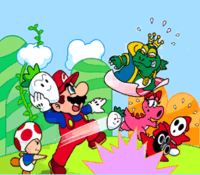 Showcase in the microgame Mario Adv., where Mario uses one to defeat an enemy. Turnips make their true 3D debut in Captain Toad: Treasure Tracker. They can be plucked from the ground by Captain Toad or Toadette and thrown to attack enemies. They award one coin when they hit a surface or an enemy. Turnips can also be used to unlock or discover new pathways by having the turnips thrown at obstacles such as POW blocks. In the minecart levels of the game, Captain Toad rides a minecart full of turnips that can be thrown in many angles at his surrounding environment. 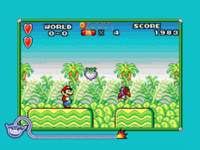 Some levels also contain turnip-shooting cannons, starting with Turnip Cannon Jungle. Additionally, Captain Toad can throw turnips at Super Gems to obtain them without having to grab them himself. Giant turnips also return from Super Mario Advance during the boss battle against Wingo. At the end of the battle, the final giant turnip thrown at Wingo by Captain Toad causes the bird boss to accidentally swallow the massive vegetable and become too bloated to fly, resulting in Captain Toad's victory. A turnip returns in Paper Mario: Color Splash as a Thing. It appears in the entrance of the Sacred Forest, blocking the Warp Pipe to the rest of the course. All eleven members of the Yellow Rescue Squad must be found in order to pull it free. When it is used in battle, it will become sliced and the slices will shred the enemies (and the screen), like the Scissors Thing in Paper Mario Sticker Star. In the Super Mario Mash-Up Pack in Minecraft, potatoes are replaced by turnips. This page was last edited on April 4, 2019, at 19:47.